It cost my quite some time to find out what caused this error message: The signature's file name was not identical with the file to be verified. To take the screenshot, I modified a valid signature's file name by replacing an underscore with a minus sign, and you will agree that such a small difference is hard to spot. While you can argue that this is a synthetic case (because signatures are machine-generated and thus comply with naming rules), it can really happen that a user (me, for exeample...) downloads an x64 binary from a website and accidentally chooses the x86 signature file download for verification. In this case, the error message is not helpful and even misleading. Note: when enriching the error message with the expected file name, please take care that the full path is readable within the small message window! GpgEX should not show any error. Instead Kleopatra should handle the error and e.g. ask for the filename of the file to be verified. 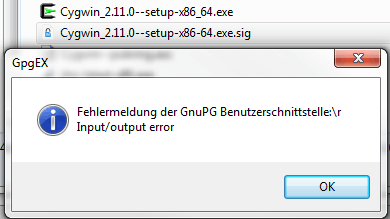 "Input/Output" error mostly sounds like a bug in the interprocess communication between GpgEX and Kleopatra.